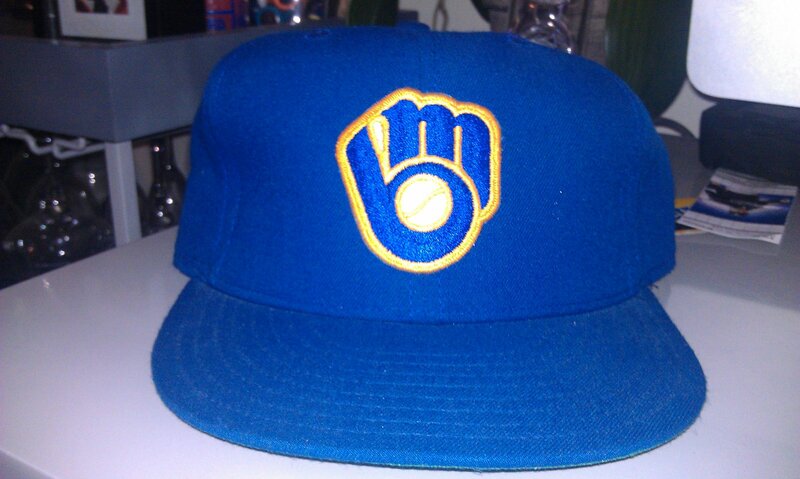 1980's Milwaukee Brewers Cap (with leather sweatband) - Fresh Fitted Friday!!!
" 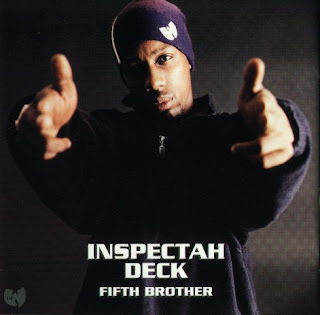 Inspectah Deck, he's like that dude that'll sit back and watch you play yourself and all that right? And see you sit there and know you lyin; and he'll take you to court after that, cuz he the Inspectah. " Fingers celebrated his 67th birthday last Sunday, August 25 and I feel remiss that I failed to honor him in last week's edition of Fresh Fitted Friday however life is too short to dwell on such moments of negligence. Instead, I'm choosing to honor him after his birthday has passed so that we may keep celebrating this amazing man! Good save (see what I did there) on my part, eh? Rollie Fingers epitomized what a relief pitcher should be in so many ways yet when reflecting upon Fingers' achievements most people oftentimes get lost in discussions regarding his handlebar mustache rather than his devastating sinking fastball. While they were both deadly weapons, I think he had something else that was almost equally as deadly in his arsenal: a Milwaukee Brewers cap from the late 1980's! At first glance, this cap is almost cartoon-like in appearance. The blue and yellow colorway is not one that conjures words like "tradition" or "class" but I enjoy it. When my interest in baseball began in the mid-1980's, this was the only cap that the Brewers wore. Even after watching so many games and looking at so many baseball cards back then, I never realized that the cap's logo was a baseball glove shaped out of the letters "M" and "B" but I did know that the cap looked cool and really, isn't that all that matters? The inside of this cap is just pure magic. 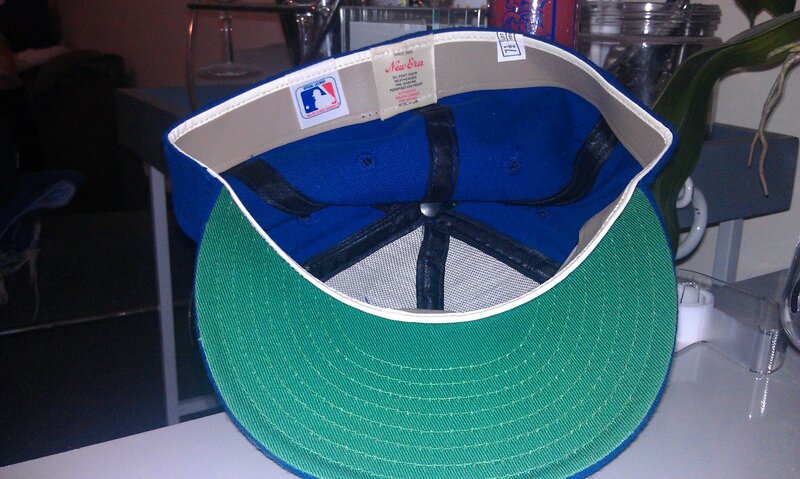 Firstly, if you have the chance to scoop up a vintage cap with a leather band, I highly recommend it. Wearing it feels strange at first but as soon as the leather starts breaking in, you won't want to wear anything else. Taking a closer look at the inside of this cap is a good way of learning the history of New Era caps. I don't have many caps with this "official licensee" tag and I am not really sure of how many years this tag was used. I also appreciate New Era brand tag in the center with the non-psychedelic font. 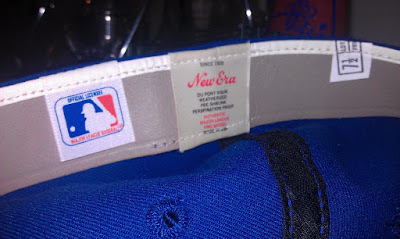 Finally, the size tag is in the old style that looks like it was meant to be ripped off as soon as the cap was purchased. Hopefully you enjoyed this throwback from way back; I always love sharing caps like these with everyone. 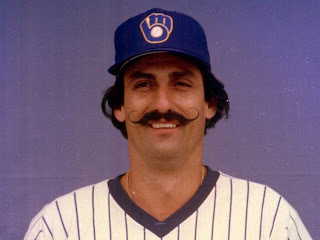 One more thing about this cap is that Rollie Fingers' birthday wasn't 100% of the inspiration as to why this is the featured cap this week. A big reason that I dig this cap now is my brother-in-law's initials are "M" and "B" and I'm extra-stoked on this guy at the moment because any day now, he and my sister are getting ready to welcome their first child into this world! Word around the campfire is that the baby's name is going to start with the letter "B" so prepare yourselves for an edition of Fresh Fitted Friday with a theme involving a cap with the letter "B" very soon!